For the past few months I have been watching my sugar intake and I noticed that all of the commercially available beef jerky packages that I find list sugar in some form as an ingredient. 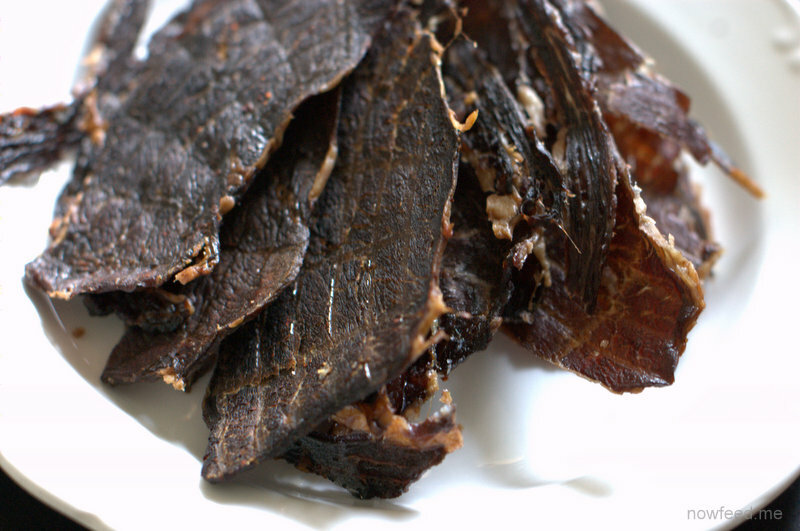 I am not sure why it is that everyone adds sugar to their jerky (I see it in most jerky recipes as well) but I dislike the sweet flavor. Here is my version without sugar or sweeteners. The look and color will vary depending on what meat you use, how thick you cut it, and how long you marinate it and dry it. Hope you like it. Slice the beef into slices just under 1/4 inch thick. Partially freezing the beef will make it easier to slice into even slices. In a ziploc bag, pour in the soy sauce and remaining ingredients except the beef. Seal the bag and shake to mix all the ingredients together. Add the beef to the bag then seal the bag squeezing out most of the air. 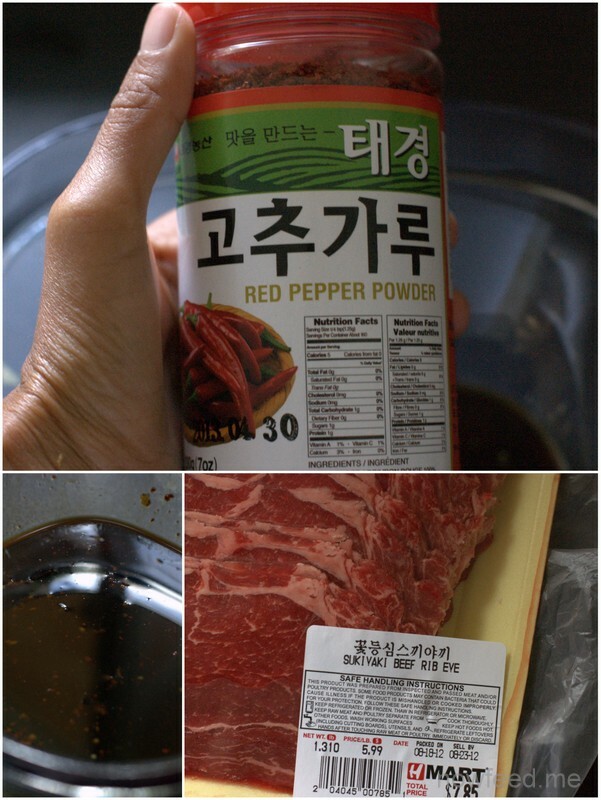 Gently massage the bag to get the marinade between all the slices and to cover all the beef. Refrigerate for 4 hours, or overnight if preparing the day before. When ready to dehydrate, remove the meat from the bag and pat the slices dry with paper towel. Lay the slices on the racks of the food dehydrator taking care to make sure the meat is in single layers and not overlapping. Dry according to the directions included with the dehydrator, usually between 12 to 20 hours. The temperature, air circulation, and thickness of the meat will determine how long the drying process takes. If using the oven lay the slices on a baking rack over a baking sheet to catch any drippings. Set the oven to about 140 degrees fahrenheit – or the lowest setting if it doesn’t go that low, place the baking sheet in the oven, and leave the door cracked open. Dry for about 6-8 hours. To simplify this recipe you can leave out the Worcestershire sauce and the liquid smoke, and even the cayenne if you do not like spicy foods. You can use regular soy sauce if wheat and organic are not a concern to you, though I used organic gluten-free tamari. Other drying methods which I have not tried but have seen or read about are using a smoker – in which case you definitely would leave out the liquid smoke, and a dry box, where you dry in full sun. I would definitely try the dry box method if we had enough sun and heat where we live, but unfortunately that is not possible. I always start off Thanksgiving week with this cranberry sauce. The kids get to enjoy the sauce on top of yogurt or pancakes before Thanksgiving and there’s always enough leftover for the turkey (in this house anyway). Combine all of the ingredients in a medium-sized, non-aluminum saucepan. Bring to a boil over high heat and then reduce to medium-low and simmer, stirring occasionally until the cranberries have popped and the apples are tender (15-20 minutes). Remove the pot from the heat and let the sauce cool. Once cool, refrigerate your sauce until ready to serve. Can be made as early as 3 days before Thanksgiving. This recipe will make roughly 3 cups. 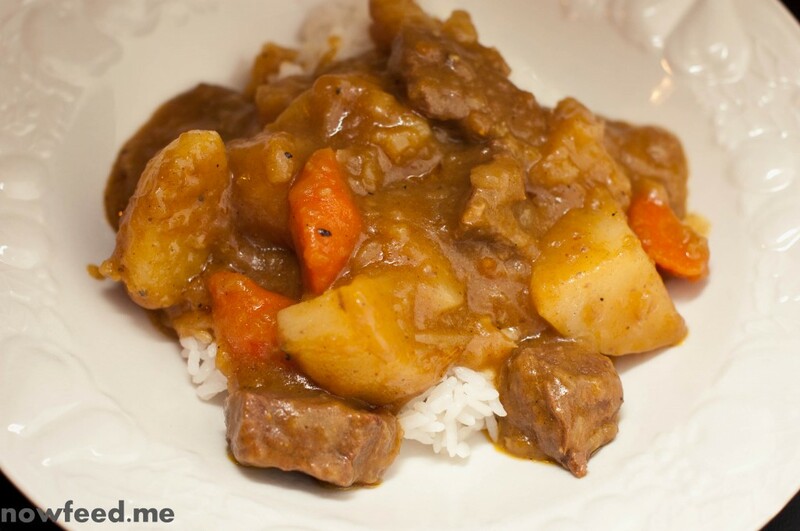 I discovered Japanese curry as a teenager after moving to Hawaii in the early 90s and have craved it ever since. One of the greatest days had to be when I was introduced to Curry House, a Japanese curry restaurant chain which opened in Hawaii. After moving away I learned to my dismay that Curry House had not made it to my new home state so I resorted myself to making curry using the packaged cubes many of us know. Frankly they’re not that bad and make for a quick and easy curry. Trying out different brands other than simply sticking to S&B the way I used to introduced me to other flavors of curry which I have come to prefer. I had wanted to learn how to make Japanese curry from scratch for may years but never got around to learning how. Part of it was because, though I am half Asian, I am not familiar with cooking with the spices involved when making curry (Japanese or otherwise). One day I learned that my blood pressure was on the rise and I had to make the decision to watch my salt intake. Knowing how much sodium is in prepackaged ramen we took a look at a package of curry cubes and saw that the sodium content in one of those packages is very high too. So I did what any self-respecting foodie with a craving would do and began browsing through cookbooks and web sites. Not being one to simply follow any recipe I took bits and pieces of several recipes and came up with my own. Round one was a chicken curry which was good but I regretted not using beef as I prefer it. While nothing was wrong with the curry itself, and everyone liked it, that it was chicken instead of beef was unusual for me and as it didn’t have a richer flavor. Well the craving for Japanese curry came again today and this time we are in a period of eating gluten-free to test whether one or more members of our family might be sensitive to gluten. So I made curry again, this time with beef and gluten-free. Inspiration as before came from several recipes, though quite a bit came from the recipe posted by Aya Tanaka on the Serious Eats web site. The recipe I made today serves 4. Start by slowly caramelizing the onions in a large pot on low heat. This is a long and slow process which can take half an hour or more. Turning up the heat too high will brown the onions which is not what you want. When done remove from pot into a bowl, turn up the heat to medium-high (6 on my stove) and brown the beef cubes in some vegetable oil for a few minutes until they are browned on all sides. Make sure you wait for the pan to heat up enough first so you don’t end up with boiled grey meat instead of browned meat. Add the carrots, the caramelized onions, and the beef broth and bring to a boil. Once it has come to a boil turn it down to simmer (3-4 on my stove) and skim off the impurities off the top. Cover and let simmer for 30 minutes, checking on it every 15 minutes or so and giving it a stir. When the meat is beginning to feel tender (like it will break easily after another 30 minutes of cooking) add the potatoes and simmer for another 30 minutes or so. Note that if you don’t like very soft carrots you can hold off on adding them after the meat is browned and add them with the potatoes. When the potatoes are done (before they begin to fall apart and disintegrate) scoop out some liquid and dissolve the roux, then add it all back into the pot and let it thicken for a few minutes. Turn off the heat and serve. Melt the butter in a small pot or pan. Add the gluten-free flour mix, garam masala, black pepper, a splash of Worcesteshere sauce, and a small squeeze of ketchup (1-2 tsp). 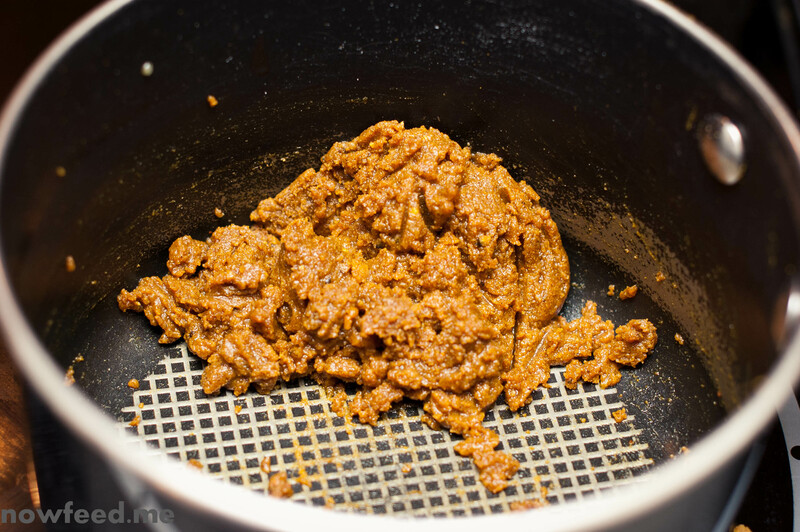 Whisk it all together quickly until it thickens into a paste. When done take it off the heat and set aside until the stew is done and you are ready to use it. You can add some Ichimi Togarashi to your plate if you want it spicier.